Photo: Early Greek Revival Cottage, ca. 1830, 31 North Chestnut Street, Fredericktown, OH. Listed on the National Register of Historic Places in 1979. Photographed by User:Nyttend (own work), 2010 [cc0-by-1.0 (creativecommons.org/publicdomain/zero/1.0/deed.en], via Wikimedia Commons, accessed April, 2015. The Knox County Courthouse is located at 117 East High Street, Mount Vernon, OH 43050; phone: 740-393-6788. As the 19th century began, individual settlers and pioneering families were moving into "the Ohio Country," the easternmost of the lands that made up our Nation's newly acquired Northwest Territory. Soon the population had passed the 60,000 mark required to be eligible for statehood, and in March, 1803, Ohio became the 17th of the United States of America. Within a few years, communities were springing up throughout the interior of the state, especially where promising farmland and convenient waterways were located. 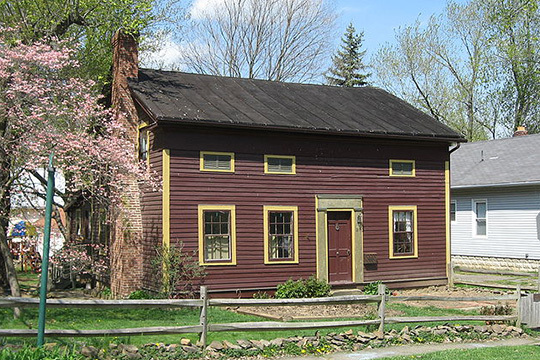 By 1805, the town of Mount Vernon had been laid out and soon several other communities were established nearby in what was then the northern part of Fairfield County. By 1808 these communities had grown sufficiently to allow the establishment of two new counties, Knox and Licking, carved out of Fairfield. By the 1830s the county's present 22 townships had been established. During the 1890s more than 35 post offices were in operation here, and in the years since, many of those communities have prospered while others have since declined or disappeared. The political subdivisions of Knox County at present include one city, Mount Vernon, and the seven villages of Centerburg, Danville, Fredericktown, Gambier, Gann and Martinsburg, plus Utica, which is located in both Knox and Licking counties. Knox County Ohio Regional Planning Commission and Knox County Commissioners, Knox County Comprehensive Plan, 2012 Update, www.co.knox.oh.us, accessed April, 2015.